Editors' Picks: 20 of the Best Things to Do in Texas! Deep in the heart of Texas you'll find the unique culture, history and terrain that influenced so many American legends. From politics (Lyndon B. Johnson, the Bush family), to music (Janis Joplin, Willie Nelson, Buddy Holly), to journalism (Dan Rather, Walter Cronkite), to sports, entertainment and more, the Lone Star State has left its mark - in more ways than one - on America. So what kind of experiences and places contribute to the colorful character of the second biggest state in the U.S.? Well, here are 20 of coolest things to check out in Texas. For three weeks every March, the city's cowboy history comes alive with rodeo competitions, big musical acts, exhibits and more. Since its inception in 1932, it's become one of the largest fairs in America. Bluebonnets are an iconic flower in the Lone Star State - and when they're in full bloom, it's a breathtaking sight. The Hill Country in particular features many areas worth driving through to drink in the beauty. Early settlers to the area - from Germany, Austria and the Czech Republic -brought the memory of the beautiful Gothic churches they'd left behind. So they recreated them, albeit painting the wooden interiors to mimic stained glass, frescoes and more. Dazzling. The former First Lady was a champion of promoting our nation's natural beauty - and this center in Austin is a gorgeous tribute to her vision. Besides an incredible display of six hundred forms of native Texan blooms, there are ponds, a butterfly garden - and an audio introduction by Lady Bird herself. No doubt about it, it can get hot during a Texas summer. 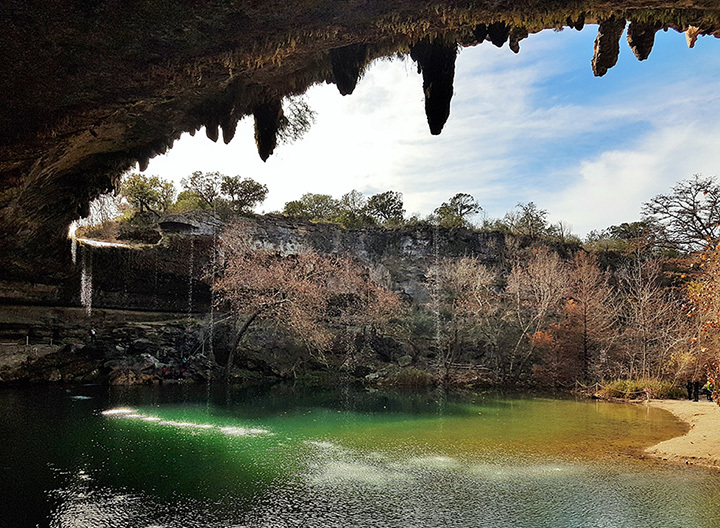 So this exceptionally-lush swimming hole is a popular spot, not just for the cool, clear water, but also for the 50-foot waterfall, caves and rugged surrounding trails. Just know that reservations are required to nab a parking spot (told you it was popular). Every August, just after the full moon, scientists and scuba divers head out at night to the Flower Garden Banks National Marine Sanctuary in the waters off Texas to witness one of nature's most amazing sights: the spawning of new coral. It's mysterious (the coral somehow knows to wait for the perfect time) and dazzling, like something you'd see in a sci-fi movie. From mid-June through August, thousands of tiny baby turtles scramble out of the sands of Padre Island and scramble to the waters of the Gulf of Mexico. Most of these take place in the early morning at Malaquite Beach. Call the Padre Island Visitor Center for details, as hatchings aren't on any exact schedule ('cause, nature). True to its name, there are 32 different springs on the property in Spicewood, one that's been in the Krause family for decades. They've generously opened it to the public for swimming, camping - and enjoying things like the butterfly garden. No wonder it's on the National Register of Historic Places. A 60-foot limestone bridge spans its entrance - and it only gets better from there. Within this network of caves (the largest known commercial caverns in America) are 10,000 different rock formations, including the 40-foot high King's Throne. Since that tragic day in November, 1963, this unassuming building in Dallas that once held books has been converted into an incredible museum honoring John F. Kennedy. Very interesting - and moving. They say that everything's bigger in Texas - and this world-famous fair in Dallas is a perfect example. Check out entertainment, livestock, eat as many corn dogs as you can and ride the Texas Star Ferris Wheel, the biggest one in America. Picture this: vintage Cadillacs lining a portion of highway outside of Amarillo, noses buried in the sand and those classic tailfins pointing to the sky. This funky (and famous) art project started in 1974, and has since drawn tourists who want to check it out - and contribute with a shot or two of spray paint (which is allowed, spray paint not included). The Wild West has left its mark on this small Texas town of Tilden. From 1858 to 1877, this boneyard was the final resting place for folks who met violent, suspicious or otherwise unsavory endings (as in "they died with their boots on"). It's one of only two authentic cemeteries of its kind in the southwest. Do a little boot-scootin' across the well-worn floors of the oldest continually operating dance hall in the state. For over a hundred years, countless country music legends have passed through this honky-tonk in New Braunfels, including George Strait and Willie Nelson. This popular network of walkways is a great way to shop, enjoy a meal or some nightlife, and learn about the history of the city. It really dazzles at the holidays, when sparkling lights adorn the trees and reflect off the river, making it even more magical. Rock legend Buddy Holly was a proud son of Texas - and this wonderful museum in his hometown of Lubbock honors his short life and career. There are many interesting bits of memorabilia - including his trademark glasses, found at the scene of his plane crash in February 1959. If you're so inclined, wander over to the nearby cemetery and pay your respects at his grave. This former Spanish monastery in San Antonio is one of the most iconic locations in America - and practically a shrine in Texas. From December 1835 through Feb. 23, 1836, a small band of volunteers (including Davy Crockett and Jim Bowie) held off a much larger group of Mexican soldiers in a move to gain Texas' independence. It's been a key hub for America's space program for decades. Besides rockets, replicas and fun videos, you can meet real astronauts and get a gander at the mission control center that played a role in so many historic missions. Can you say, "Houston, we have a problem"? It's located in the boyhood hometown of Admiral Chester Nimitz, who commanded the Pacific Fleet in WWII. This fascinating museum in Fredericksburg houses vintage military vehicles, living history recreations and other exhibits that provide an incredible view of battle life in the Pacific Theater.